I ran a wildlife refuge once. My wife Cathy and I lived at Long Point in West Tisbury for nearly a decade, and when we left so I could work with The Nature Conservancy, we moved back to the town we came from, Oak Bluffs. We bought the childhood home of a close friend near the heart of town and in the epicenter of family, old friends, and work. It was good to be back. But the town had changed so much from the quasi-rural community I grew up in, where bobwhite quail were common backyard birds and Luna moths landed by the porch light. The culture shock was expected but hard nonetheless. We had moved from a square mile of intact land where wildlife abounded to a town carved up by pavement and sterile lawns. Instead of a diversity of species, we had a hyper-abundance of only a few – weeds like bittersweet and pests like skunks, rats, and crows. So partly out of nostalgia and partly out of bio-boredom, I changed my yard. I got native plants from my neighbor Jason Ben David, who rescued them from a construction site. Carol Knapp gave me seeds from Josie Bruno’s native wildflowers, who got seeds from Anne Hale’s plants, who got them from horticulturist Polly Hill herself. Carlos Montoya delivered some mature shadbush. I got holly saplings from my parents’ yard. Luanne Johnson grew from seed some rare native grasses. David Billings helped me dig a pond. 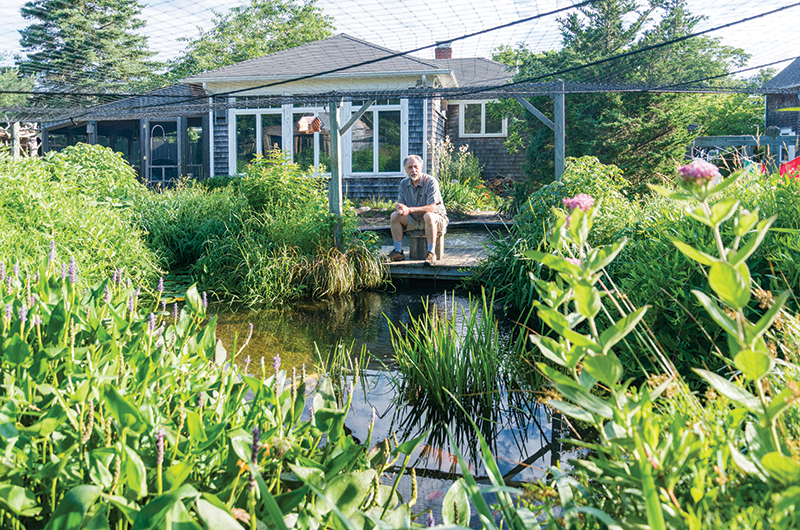 Since installing water habitats and cover, Chase has recorded more than twenty-three bird species breeding on his half-acre property near the center of Oak Bluffs. The dragonflies and green frogs moved in on their own. An otter found my goldfish and wiped them out – which turned out to be a good thing. The goldfish were so prolific they ate too many of the native pond invertebrates. So I replaced them with the less prolific koi, along with a net to protect them from the ospreys. Eventually, I’ll take the koi out too; if you want a diversity of life in a pond, don’t include fish. I created brush piles, left dead wood standing, and opened patches of sand for native bees to nest in. They found their way in too. I hid quarter sheets of plywood amid the thatch I let build up, and meadow voles moved under them, and then shrews, who ate some of the voles. Lynn Bouck and I built nest boxes, and in my half-acre I have had twenty-three species of birds breeding – not all in the same year, but many more in any year than I had at the outset, which were English sparrows and starlings, both pest species. I get many more native birds during migration. Occasionally, Matt Pelikan, my friend and work colleague, comes over and tells me what species of grasshopper, hover flies, or skippers I have. He found an insect species new to the Vineyard once, but I have never found any ticks. I was managing a wildlife refuge again. While it lacked the space of Long Point, it gained in a new dimension: depth. My yard was as rich in human community as it was in the natural one. It was almost like getting a bit of old Oak Bluffs back. The only thing missing was the sound of pinkletinks in spring, so a buddy of mine gave me a few from his place. You’re not supposed to move wildlife, but these had already been moved. So I plunked them in my pond. What if wildlife could thrive not despite people, but because of them? That was the question that Matt and I pondered over beers on a ferry back to the Vineyard. We had just come from a very depressing presentation on the effects of habitat fragmentation. Traffic crushes turtles and salamanders, house cats kill birds, outdoor lights disorient moths and migrating birds, pesticides kill bees and butterflies, fertilizers and road runoff pollute groundwater and whatever brooks or ponds they drain into. The suburban mortality rate is so high, for so many reasons. And as native species decline, so do many of the services they provide: native bees that pollinate crops, birds that devour pest insects, predators that eat rats, a diversity of plants that take up excess nitrogen, even soil microorganisms that neutralize toxins. To compensate we import non-native honeybees, apply pesticides, put out poison blocks, buy off-Island shellfish, and chlorinate our drinking water. We pay for biodiversity loss. 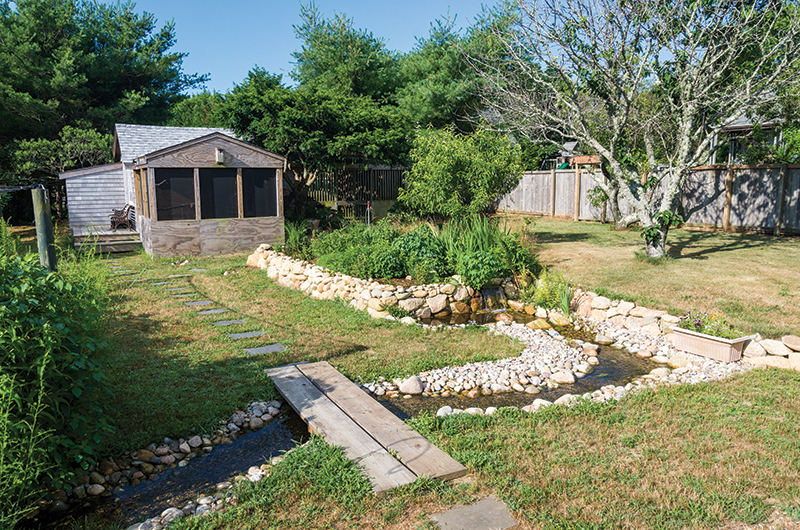 A man-made pond flows through the backyard. The problem is, if you just try to eliminate pest species, you leave a vacuum in the ecosystem. What moves in to replace the pests you’ve taken out? More of the same pests. There is a steady supply. To get ecosystem services back, we need to help native species compete for ownership of our backyards. Matt and I pondered how we might help native species get a level playing field. Why, we asked, do pest species proliferate in fragmented habitats when they are subject to the same levels of mortality? Perhaps it was just the beer, but the answer seemed obvious. Pest species do suffer high mortality in suburbia. They just produce enough young to outpace it. Or, in the jargon of wildlife managers, “the rate of reproduction exceeds the rate of mortality” and so the population remains stable or grows. Why are pest species so prolific? Because critical resources are so readily available. Suburbia provides the right kind of food, water, and cover (places to hide, hibernate, lay eggs, or rear young). Lawns, sprinkler systems, unfenced compost piles, non-native plants, bird feeders, road kills, unfenced spaces under sheds and decks: that’s everything that a skunk, rat, starling, and Japanese beetle could want, and all so conveniently located. We wondered, what if we intensively managed backyards so that they provided the right combinations of food, water, and cover for the species we do want rather than try to eliminate the ones we don’t want? Could native species, like pests, be able to reproduce at a rate that exceeds suburban mortality? Would enough people participate to make a difference? By the time the ferry docked, we were determined to find out. Matt and I created a pilot project that we called the Vineyard Habitat Network, funded by a generous donor to the conservancy. Our focus was not the large private properties but the ones down-Island, where there was the greatest habitat fragmentation. We reached out first to volunteer property owners who did not self-identify as conservationists. If “backyard conservation” were to work at a scale that mattered, then it could not be perceived as the domain of the conservation elite. 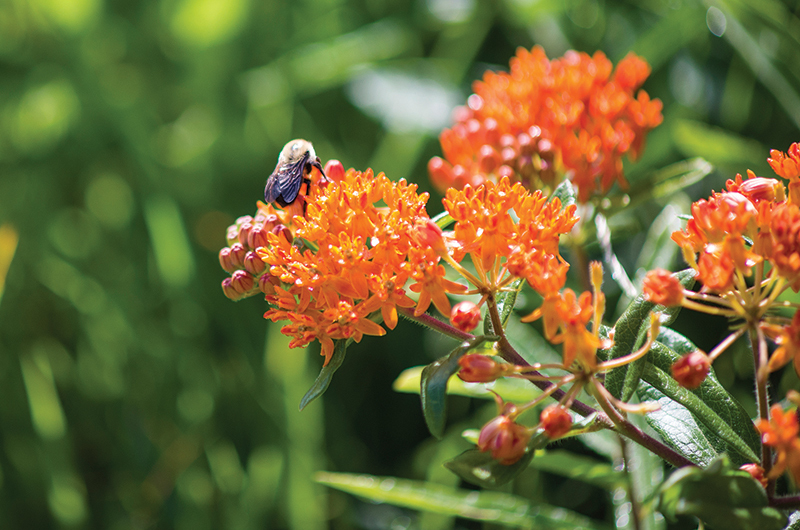 Butterfly weed attracts butterflies, of course, but also native bees. Finally, we committed never to lecture. The scientific literature on wildlife management is vast, but it is mostly researched on large tracts of land. No one we had ever heard of had managed large tracts of fragmented land. We – the private property owners and the conservancy – were going to have to learn how to do this together. We went to listen to what property owners wanted for themselves, and then based our backyard management recommendations on that. News of the project traveled mostly by word of mouth, up-Island and down. By the end of the first year, more than a hundred Vineyarders had signed up. To give some sense of the value of that participation, at around the same time the conservancy had secured roughly a hundred acres in West Tisbury at the highly discounted price of $881,866. The Vineyard Habitat Network had registered four hundred acres of land, all of it volunteered. The experiment seemed to be working. Now the question was, how could this approach be made to work in much larger and more fragmented landscapes off-Island, where in many places the needs of people and wildlife are so much greater? After all, more than 40 percent of the Vineyard is already conserved. What about inner-city and underserved communities where there are few backyards, and where research has shown that a dearth of natural surroundings significantly impacts the health of its residents? Through conservation circles we learned of a wonderful program, YardMap, run out of the Cornell Lab of Ornithology. It was a web-based citizen science tool where volunteers could download satellite images of their property and map their yards. With this information, scientists could see how backyard practices affected wildlife, particularly birds. The lab and the conservancy joined forces, re-branding the tool as the Habitat Network. Now, in addition to being a citizen science tool, the Habitat Network (yardmap.org) is a social network platform where participants can upload photos, post questions, and get replies from Cornell staff and fellow participants. It allows the formation of groups that can track their own ecological goals and has “learn” pages full of the latest research on backyard wildlife management. 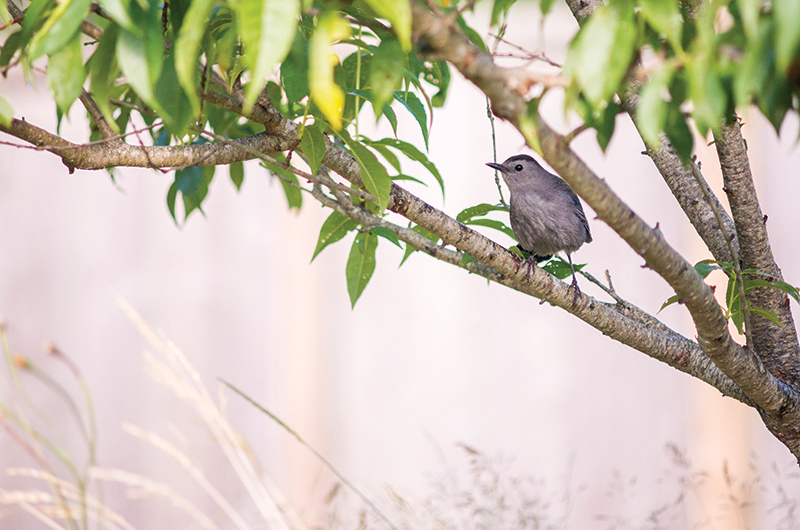 A catbird takes a break on a tree limb. Two years into the Cornell-Conservancy partnership, it has more than 250,000 registered participants and more than 600,000 acres of land mapped, managed, and monitored for wildlife. So far, it is growing at a rate of about 25 percent per year. A concerted effort to introduce the Habitat Network into five cities in order to learn how to adapt the tools and the practices in that environment, especially for underserved communities, has helped the program to continue to evolve in ways that make the tool easier to use and more relevant for a diversity of participants. Pinkletinks famously chorus from Island ponds in spring, but I’m just as happy hearing their infrequent chirps in the fall. They spread over my yard seeking deep leaf litter under which to pass the winter. I don’t know what their autumn call means to each other, but I know what it means to me. It means my friends and family and I reclaimed a bit of our Vineyard heritage and, in doing so, maintained a thread of our community too. The skunks and raccoons will get some, but not all. They may make it yet. If so, they have what they need for the full cycle of life, close to home, and so do I. There’s nothing more winter-proof than remembering the sound of pinkletinks in spring. What can you do to increase biodiversity in your yard? There is now a great deal of research underway on the impacts of suburban landscape “homogenization” and fragmentation, but still much to be learned on what the most beneficial practices are to support native species and the ecosystem services they provide. Each native plant and animal has specific needs, meaning each property has greater potential for some species than others. I make wildlife management and landscape design recommendations based on the characteristics of the individual property and the interests of the owner. However, yards are commonly lacking in some habitat features, meaning that many wildlife species must travel hazardous routes to other properties to get all the resources they need. Here are three features I most often recommend in close proximity to minimize that vulnerability. 1. Introduce water. Add a shallow pond or other water source on the ground, no matter how small. Make sure it has sloping sides so small wildlife can get in and out. Don’t put fish in it (they eat a lot of species). Include a pump and filter system, especially if the pond is in the sun. 2. Provide cover. Plant dense shrubs and thick growth of native grasses and wildflowers, especially near your water. Lay down sheets of plywood, at least two by four feet, preferably in the sun, hidden in thick vegetation. Insects, small mammals, reptiles, and amphibians may use them. Brush piles can be hidden behind flowering shrubs or in out of the way corners. 3. Add native plants. If you must remove plants from your yard to make space, first remove the non-native ones (especially pest species like bittersweet). Sacrifice any of your lawn that you don’t really need. If you can, get a botanist or conservationist to identify native plants already in your yard; it is best to build from what you already have. If you need to add native species, Polly Hill Arboretum in West Tisbury is a great source to get native species grown from Vineyard gene pools. So agree with you..My husband and then-young son-dug a pond about thirty years ago. It's about 50/50 naturalized, along with some ferns we introduced and some perennial plantings (iris); but as we're getting on in years, have come to appreciate the ease of letting things completely naturalize. I found a couple of milkweeds in the yard and have moved them over near the pond. We went through goldfish and many years of koi. After losing them, we left things alone. Now we are entertained by bullfrogs and tree frogs--much more fun. Thank you for your instructions. We are utilizing them to grow our natural habitat even more! I loved this article! It strikes right in the middle of what I want to promote in suburban Boston.